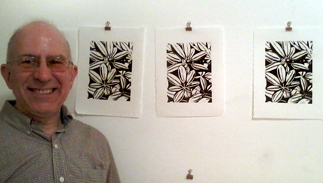 Last Sunday artist, designer, bookmaker, creator of all really cool things, Andrew Borloz came over for PrintSocial. I knew I was going to see some really good and methodical working methods with Andrew, or as he signs his email &rew. To my surprise he brought me an orange rectangular ceramic box filled with homemade cookies. Those cookies are the best I have had in as along as I can remember. I tried to make them last but they were so good I ate them all. Now I keep my special objects in the box for safe keeping. &rew got to work very quickly. 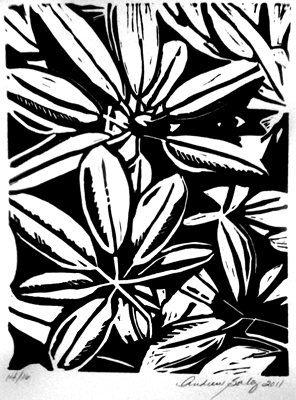 He had made a digital image of flowers, flowers that grew in his front yard, and reduced the shapes down to simplified black and white. We used saral paper to transfer them onto the lino block. Then &rew got to work carving. It was his first time carving a block and his precision was amazing. He made each cut come alive as the leaves formed and stretched out over the plate. In no time he was done. We inked up the block and I had a stack of nice Japanese Hosho paper to print with. I pulled print after print but they were uneven, they wrinkled, it was really frustrating. After about 2 hours of trying to get a good print I offered to take the block to work and pull the edition. Sure enough at my LIU studio I was able to pull an edition of 16 in less than 25 minutes, all perfect. Today I met up with &rew to sign, number and date the prints. When I met him at my front door, he was wearing a bright red wool baseball type hat and red plaid scarf. It was a wonderful sight from all the drab black and grey on everyone especially this time of year. My dogs were thrilled to see &rew again, Conrad throwing himself at &rew and Homer jumping like a mad jumping bean. Fortunately they settled down as he signed the 16 prints. They are really beautiful. I highly recommend you check out Andrew Borloz on Facebook. I know you will be wildly surprised at his photographs of New York. I have never seen a person with a more keen eye. One day we were walking along 42 street coming from Pfizer where I had an exhibition and &rew was checking out ever cornice, windowsill, building edge and showing me things I have never thought about. He also walks the entire city, everywhere he goes. You think I run a lot but &rew walks across town, from uptown to downtown, from midtown to DUMBO. He walks everywhere, to stay slim he said, but I really think it is to see everything possible. His enthusiasm for art, design, every day visual moments is phenomenal and it shines in his photos cataloged on his FB pages. By looking at his photos one may think the entire city is one big beautiful holiday decoration every day of the year. So as it goes will all PrintSocial prints, I always sell two of my three prints and always for $35 to keep funding this project of inviting people over to socialize, make art, and have a really positive experience. Thank you &rew for joining me.